The 80-foot-high video mast outside the Boston Convention & Exhibition Center holds seven fullcolor LED screens onametal spine. Boston isn’t known as a city of lights. With the exception of the Citgo sign in Kenmore Square, Boston never embraced the loudly lit entertainment districts or neon-framed skylines that are the trademark of other major cities. But Boston is now taking a few more cautious steps with the planned addition of several striking electronic marquees, or outdoor video displays, that will use state-of-the-art digital technology to show advertisements, community information, and video art. The success of two distinct video displays at opposite ends of the city has convinced Boston officials to allow more electronic marquees: the giant digital screen at the new WGBH headquarters building next to the Massachusetts Turnpike and the 80-foot-high video mast outside the Boston Convention & Exhibition Center that holds seven enormous full-color LED screens on a metal spine. The display is owned by the convention center and managed by Orange Barrel Media, the Ohio-based display company that installed it in September. The marquee, as well as a large video “wall” inside, is expected to produce around $300,000 in ad revenue for the convention center for the current fiscal year, and authority officials expect that will increase by a third next year as more convention sponsors learn of the video capability. The display cycles through different content: from a promotion for a trade show to an advertisement for a nearby restaurant, and weather, community announcements, art, and other information. Now Orange Barrel Media has confirmed it is in talks with private property owners to put up similar marquees in the three neighborhoods where they are allowed by the city: around Fenway Park and in the Theatre and Seaport districts. City officials said major media companies, including behemoth Clear Channel Communications Inc., have expressed interest. In a statement, Clear Channel said it did “not wish to speculate” about any plans. For now there do not appear to be any other video display marquees slated elsewhere in Massachusetts, according to government and industry officials; moreover, as in Boston, such displays are sharply limited and, for example, are not allowed at all on any roadways overseen by the state, such as local highways. Massachusetts currently forbids video marquees along its roads, concerned they will distract drivers. The state is, however, adopting regulations to allow under certain circumstances digital versions of the old paper or vinyl billboards — those that can change messages electronically as long as they display only static images. Civic content on the planned video displays will take various forms. At the convention center, for example, the display showed video art by local artists to promote an open house last fall at the nearby Fort Point Arts Community. To the delight of many artists, out-of-towners attending a convention flocked to the open house. Kairos Shen, director of planning for the Boston Redevelopment Authority, said the marquees are “dynamic architecture” that will provide more than just advertising to residents and visitors. 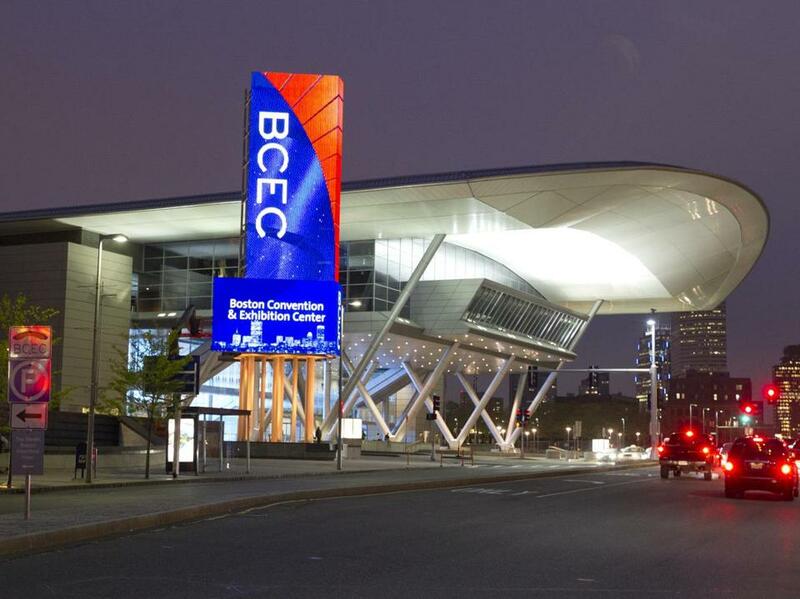 James Rooney, executive director of the Massachusetts Convention Center Authority, said displaying content about the surrounding community and other helpful information is a crucial function of the marquee outside the Boston facility. The locations of the new marquees are still being negotiated, but like the one at the convention center, they will not be placed in residential areas where neighbors may see them as an unwelcome intrusion. When permitting WGBH’s eye-catching video display over the Massachusetts Turnpike, the BRA restricted additional new signs to commercial areas near Fenway Park, the Seaport District, and the Theatre District. “We wanted to find appropriate places in the right districts where [the signs] would enliven those portions of the city,” Shen said. Fenway Civic Association president Bill Richardson said his group would withhold comment until there was a specific proposal, but was usually amenable to creative signage in commercial areas. Orange Barrel president Peter Scantland said the marquees will be interactive: For example, if a car ad is featured on the display, passersby with a smartphone could use an app to customize the color and features of the car, then see the result on the large display. The city feels the first marquee at the convention center accomplished one of its primary goals, which was to help cement the image of the South Boston waterfront area as a tech-friendly Innovation District. It also appears to have helped the convention center authority attract big conventions, which rely heavily on advertising from sponsors to finance their events. Conventions can buy bulk advertising time on the sign from the authority, then sell it to vendors and sponsors. Michael Garner, who planned the National Cable & Telecommunications Association’s recent gathering, said the marquee’s capabilities distinguished the Boston hall from others. Dan Adams can be reached at dadams@globe.com and on Twitter at @DanielAdams86.